Earlier this year we received an email from Furch Guitars—a premium quality acoustic guitars maker in the Czech Republic—inquiring about our native species forests. Furch is interested in ensuring the sustainability of the hardwoods used in its guitars, namely Rosewood (dalbergia retusa) and Mahogany (swietenia macrophylla). They agreed to finance the maintenance of a Rosewood plantation belonging to our partner community Arimae. Rosewood and Mahogany are found in some of our partner community Arimae’s newer forestry plots. We were instrumental in helping Arimae establish its four hectare (about nine acres) Rosewood plantation in 2010 through a grant from the Global Environment Facility’s Small Grant Program (GEF SGP). A smaller and neighboring Mahogany plantation had been established by the community itself about 8-10 years earlier. The community considers these plantations one of their investment strategies. The proceeds of the GEF SGP grant covered the costs of maintaining the Rosewood plantation for a year, but when the funds ran out Arimae couldn’t perform the subsequent weeding and pruning. 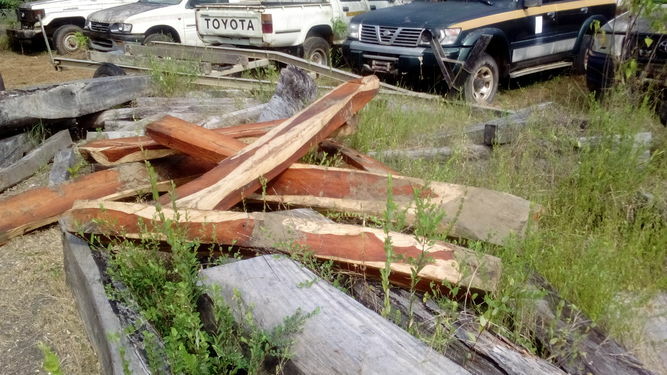 The community did not have its own resources to pay for the maintenance because of legal bills associated with securing its formal land title. We helped over the years by cleaning the plantation and planting plantains, whose frequent cleanings also benefited the Rosewood trees. When the plantain project ended a couple of years ago, competing vegetation once again began to hinder the Rosewood trees’ growth. With the support from Furch Guitars, Arimae cleared competing vegetation from between the Rosewood trees and pruned the trees of excessive branched. The cleanings ensure vines don’t inhibit the trees’ growth, and that pioneer trees don’t outcompete the Rosewood for sunlight. The pruning improves the future quality of the wood by reducing knots while also encouraging the tree to grow taller and straighter. Our conservative estimate is that the four hectare Rosewood plantation adds annually about 26 cubic meters of harvestable timber annually. That amount is more than what Furch Guitars currently uses, so the company is being extra judicious in its support to ensure it grows a sufficient amount of Rosewood for the future. Before we started finalizing any agreement with Furch, we first discussed with the community of Arimae to ensure its interest and secure its consent. Community members from Arimae receive competitive pay to do all of the cleaning and pruning work—an additional benefit coming from the collaboration. PE and the community of Arimae want to thank Furch Guitars for the support and hope the collaboration is of the long term kind. Legit bridges mean no more getting stuck when the rivers flood! I was in Panama the week of July 17, following the passing of one of our land lease partners Juan Cruz. My main goal was to make sure the new owner of the land, Juan's widow Rosa, is still on board with the project, and make any administrative changes necessary to ensure a smooth transition. I also had a chance to check in on all the operations and meet up with our operations director Francisco. Though sad, Juan's passing was not surprising. He was in his 80's and had heart problems ever since before I knew him 10+ years ago. From what Rosa explained, he was often stubborn about going to his medical appointments, and had other medical problems in addition to his heart. As one of the founders of Nuevo Paraiso, he will be missed by his numerous children and grandchildren. Before he died Juan divided his land holdings between Rosa and his two sons. Our five-hectare lease sits within Rosa's land, and she is keen to continue working with us and receive land lease payments. We set up a new cooperative account in the name of Rosa and her daughter Mygdaliz to receive the lease payments. Mygdaliz lives in Panama City and therefore is easier to get in touch with. Strategically, maintaining this relationship is important because we expect Rosa will eventually pass the land to Mygdaliz. This was the first time we've dealt with a change in land owner, and it seems to be going smoothly. Last dry season we suffered a fire in Juan's (now Rosa's) finca. The fire came in through a narrow swath running along the river, where we didn't expect anyone to be burning. Usually, the danger comes from people burning in their adjacent fields in preparation for the planting season. The fire burned away the crowns of the native species and caused the bark on the trees to crack. Lacking bark coverage, the trees are susceptible to fungus and insect attacks and most won't survive. The good news is that the teak resisted the fire a lot better than the native species. We will let the affected native species trees die off naturally and focus on maximizing the production of the other blocks of trees. In Chico's finca (the one planted in 2007), the blocks of teak are looking good and will be thinned out in the next couple of months. We have been on the lookout for a buyer for the teak, but so far have not had any luck. We have a block of mahogany growing very well, and some of these trees will be thinned to create space for the larger ones. Our operations manager Francisco wants to experiment with a technique called tree-topping instead of clear cutting the trees marked for removal. This would leave the trees standing, but remove their crown to reduce sunlight competition. Theoretically, the trees would no longer grow upwards, but would rather increase in girth and therefore can be left to harvest for later. Jose "Ino", who used to work for us on a permanent basis in Nuevo Paraiso, is doing well, and his wife Esther just had their 4th child (he says this will be the last one). 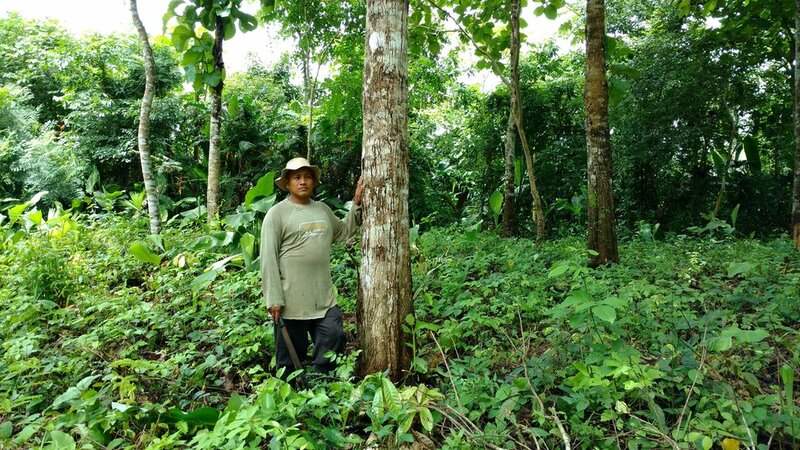 Ino has been a dependable talent for us, and we expect to work with him on the thinning of the Nuevo Paraiso plantations. In Arimae, I walked through fincas 1-3 with our point of contact Yem. Fincas #1-2 have been thinned. We left the native trees to decompose on the forest floor and stockpiled the teak in case we find a buyer. We noticed that the cedro amargo trees (cedrela odorata) have been growing strongly here. The teak trees are on the whole looking good, with the largest ones exceeding 12" in diameter. They need to be de-branched (podar) to make sure the wood they eventually yield is knot-free. The teak that I saw in the #3 finca is looking very good - tall, straight, and little bifurcation. These also need to be de-branched, and could even be thinned. Planted in 2012, this teak will eventually surpass our teak planted in 2007-2008, a testament to the importance of weed suppression early on. We took the motorized branch trimmer (it's a chainsaw on a pole) to be repaired, and rigged up another manual tree trimmer with an aftermarket saw blade. So, now we have two functioning branch trimmers ready to go. Meanwhile, the roads and infrastructure is improving in the Darien. 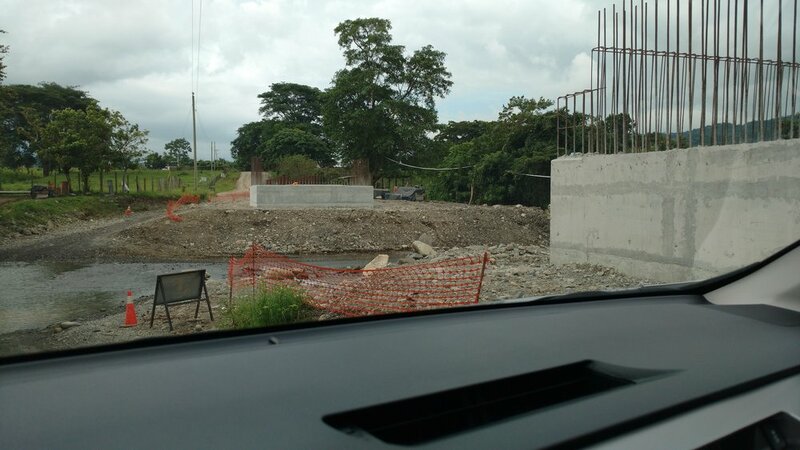 The Ministerio de Obras Publicas has been re-paving the roads and is actually installing guardrails along some stretches, and soon there will be legitimate bridges over the rivers in the Nuevo Paraiso area.